As many of you know, I love all things beauty, however I get all hot and bothered about skincare, especially serums. Why do I love serums you ask? Because well-made serums are active, pack a lot of anti-aging punch, and typically deliver both instant and longterm results. If forced to pick my favorite skincare essential, it would without a doubt be a serum. Following are ten serums that I have been testing over the last several months and I just can’t get enough of them. Some are spendy and others are more affordable, but either way these serums have impressed me and made my skin very happy. I hope you enjoy this very special curated collection of serums, here’s to a more gorgeous, youthful glowing you! I adore Kate Somerville and am continually impressed with her beautiful skincare creations and Restor8 does not disappoint. This luxuriously silky serum is formulated to rescue, restore, and renew your skin with a proprietary anti-aging complex. Restor8 gets its name because it addresses eight signs of aging which include wrinkles and sagging skin, dehydration and lack of volume, dullness and uneven pigmentation, roughness and enlarged pores. This divine serum contains a sophisticated concentration of vitamins, nutrients, peptides, and antioxidants to help smooth and firm, moisturize and plump, even out skin tone, and refine texture. What do I LOVE about Restor8? It instantly nourishes and renews my skin on contact. I have especially been loving using this serum as we eek out of summer (although it’s about 85 degrees in LA today as I write this) because it really has nurtured and put my summer parched skin back together. It makes my skin look smooth, soft and supple. LOVE! Shaping Facial Lift is a genius and active serum that defines and sculpts your face, diminishes fluid and puffiness, smooths, lifts and refines your skin. This serum contains a powerful complex of three powerful plant extracts—guarana, zerumbet ginger, and kaki which all work together to refine facial contours, define the look of cheekbones, and visibly lift your jawline. What do I LOVE about Shaping Facial Lift? First of all it smells like a luxurious French Spa and second, it works! It instantly tightens and lifts my skin. I love using this before events when I want to look sculpted, fresh and awake. 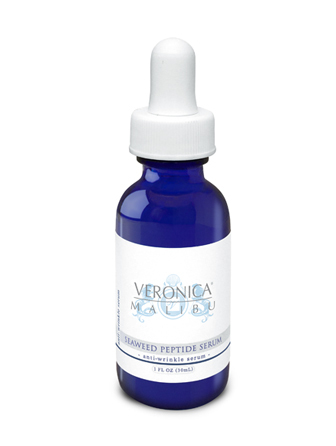 Veronica Malibu Seaweed Peptide Serum is an advanced, fast-acting, anti-aging serum for reducing lines, wrinkles and furrows. This beautiful serum is formulated with seaweed and the most recent technology in wrinkle relaxers and botanicals to rejuvenate and make your skin smoother, younger and more vibrant. This impressive serum delivers a visible difference in 5 minutes and it it can also extend the lifespan of facial injections. What do I LOVE about Seaweed Peptide Serum? It totally transforms the look and feel of my skin in moments! I love how this serum instantly smooths and softens the texture of my skin and over time it has softened my lines. I also love supporting local beauty brands like this, and Veronica is based very close by in Malibu. FAB! Yes I’ll admit it, this serum is uber spendy and indulgent, but it really transforms your skin! Skin Caviar Liquid Lift contains La Prairie’s proprietary sea derived caviar beads which delivers incredible firming and amazing lift as well as helping to repair past damage, rejuvenating your skin, helping to prevent the deepening of lines and wrinkles and really hydrating, nourishing and protecting your face against aging. What do I LOVE about Skin Caviar Liquid Lift? It’s a total guilty pleasure all for me! I adore the luxurious packaging and when I put this gorgeous serum on, my face just drinks it up and it instantly looks supple, fresh and well rested. Over time, I have noticed a softening of fine lines and a swoon worthy smoothness that this serum has given my face. OBSESSED! I love when practicing derms share their wonderful products with the rest of the world and Dr. Dennis Gross is masterful at this (can you say Alpha Beta Peel?) Well, I am delighted about Dr. Gross’ new Brightening serum, a professional-strength solution which is formulated to combat all types of uneven skin tone (one of my biggest skin concerns.) This impressive serum contains Ferulic Acid and Retinol which are potent antioxidants used to diminish sun and age related dark spots, Azelaic Amino Acid and Bearberry are used to address hyperpigmentation and Salicylic Acid and Willow Bark help treat blemishes. What do I LOVE about Dr. Dennis Gross Brightening Solution? It has noticeably diminished my brown spots over time! I love the unique fluid-like delivery system that absorbs instantly into my skin and that you can use it as an all over treatment like I do or as a spot treatment with the included microfiber cotton pads. This is a very impressive over-the-counter results oriented product. I’m an ardent fan of SK-II Facial Treatment Essence and have RAVED about it before (as is Cate Blanchett) because it makes your skin noticeably bright and luminous and because of it’s efficacy, I am always excited to try new products from this fabulous line. This Aura Essence contains an aura complex and the line’s signature Pitera to reduce your skin’s hidden and visible spot formations to reveal a brighter aura glow. This serum hydrates, helps diminish discoloration, and most notably refines your skin’s texture and transparency so that it boosts light transmission within the surface. More light transmission creates a healthy looking natural glow and makes the look of discolorations such as age spots have a less obvious contrast to natural skin color. What do I LOVE about GenOptics Aura Essence? It noticeably lightens and brightens my skin on contact as well as over time. I think it makes my skin look younger and vibrant. I also love how this serum instantly penetrates into the skin and gives my skin a lovely fresh smooth feeling. Dermalogica has done it again with this exciting new powerhouse serum that targets hyperpigmentation, fine lines, wrinkles, and sagging skin, nice! Multivitamin Power Serum contains microencapsulated peptides and Vitamins A (Retinol), C, and E which are designed to deeply penetrate your skin, repair damage, boost elasticity, reduce dark spots, and smooth out the appearance of fine lines and wrinkles. What do I LOVE about Multivitamin Power Serum? I love the fresh citrus smell and how silky smooth it makes my skin feel. Over time, it has freshened my skin and made it look younger and more even toned. And it packs a lot of active anti-aging punch at a more affordable price. iS Clinical Active Serum is a potent formula designed to reduce fine lines and wrinkles, hyperpigmentation and control acne. It contains an impressive array of active anti-aging ingredients which includes glycolic, lactic and salicylic acid, arbutin and kojic acid which all work together to smooth texture and decrease pigmentation. What do I LOVE about Active Serum? Everything! This is a fabulous one-stop shop serum that instantly transforms my skin both in the moment and over time. I love the light menthol scent and the slight tingly feeling I get when I apply this serum, it makes me feel like it’s working. My skin feels soft and supple after use and over time it has transformed the look of my skin. This has been my go-to serum when my skin is wigging out, breaking out and needs triage, I wake up the next morning with almost perfect skin. I am just getting acquainted with the Sjal line and am finding it really innovative and exciting. The Sjal skincare line is based on principles of ancient eastern medicines, using the purest eco-ingredients with the latest western bio-technology, and charged with essential precious minerals and gemstones. Sjal Bio-regeneratif Serum restores radiance and enhances the benefits of other anti-aging products. It has a lactic acid, antioxidants and vitamins A, C and E which work together to provide intense hydration, cell regenration and reduced fine lines, pore size and pigmentation. What do I LOVE about Bio-regeneratif Serum? What I find intriguing about this line is that it uses malachite extract and Sjal’s signature gemstone and mineral blend for protection, radiance, energy and even skin tone. It’s different than many products out there because it uses gemstones and minerals to rejuvenate the skin. My skin adores this serum and just drinks it up. Every time I use it, I get tons of compliments on my skin. I feel like this serum infuses my skin with a magnificent energy that makes it radiant, supple and glowing. I can’t get enough of this one! We are all familiar with NARS as a makeup brand, but I have been rather impressed with his skincare offerings. Optimal Brightening Concentrate is an illuminating serum that boosts radiance with a proprietary Light Reflecting Complex. It contains encapsulated Noni Fruit Extract to revitalize the skin and boost cellular energy and Multi-Action Vitamin C to brighten and reduce hyperpigmentation. This serum is designed diminish dark spots and give you a bright, luminous, even complexion. What do I LOVE about Optimal Brightening Concentrate? It is a wonderful product to use after your skincare regimen and before applying your make-up because it primes the skin and delivers the most gorgeous slightly pink iridescent sheen that totally lights up your skin. It helps give my makeup that coveted lit from within look. Disclosure: I was sent samples of all of these serums for editorial consideration, but the radiance and luminosity are my very own. « HAPPY HALLOWEEN MY PRETTIES!! !